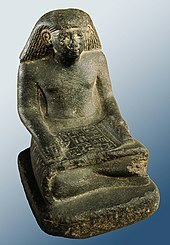 ^ "Scribes", Life in Ancient Egypt, Carnegie Museum of Natural History: 存档副本. [2013-07-31]. （原始内容存档于2009-01-25）. . Retrieved 29 January 2009. ^ Peter Damerow, Abstraction and Representation: Essays on the Cultural Evolution of Thinking, Springer 1996, ISBN 0-7923-3816-2, pp.188ff. ^ Budge, E. A. Wallis. The Gods of the Egyptians. New York: Dover Publications, 1969 (original in 1904). ^ Bruce Metzger and Michael Coogan, eds., The Oxford Companion to the Bible.